On February 12, 1771, Swedish King Adolph Frederick died after ingesting 14 servings of semla served with bowls of hot milk. The semla was only the dessert; the rest of the meal had been equally substantial. With such obvious self-restraint issues, I am surprised that he lived to be 60. Anyway, what's semla? According to various oonline sources, semla is something of a seasonal dessert, having traditionally been eaten on Shrove Tuesday (the day before Ash Wednesday, which is the official start of Lent, often called Fat Tuesday) in Sweden, Finland, and Estonia. I looked up February 12, 1771, on a perpetual calendar and it was Shrove Tuesday, all right. I guess that King Adolph Frederick was making sure he didn't start Lent on an empty stomach. Since the rise of Protestantism, the semla season now runs from Shrove Tuesday to Easter. But what IS it? Basically, it seems to be a cardamom-flavored wheat bun, top sawed off, body hollowed out and filled with a mixture of the crumbs and almond paste, topped with whipped cream, and finally the sawed-off top, which is dusted with sugar. 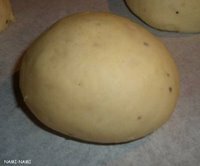 It can be served in a bowl of warm milk or plain. Take all the ingredients to the room temperature about an hour before starting. First make the dough. 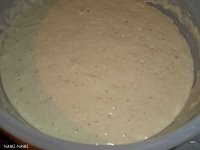 Crumble the fresh yeast into a bowl and add the lukewarm milk little by little, stirring with a wooden spoon until the yeast has dissolved. Add about half of the flour, stir with the spoon. 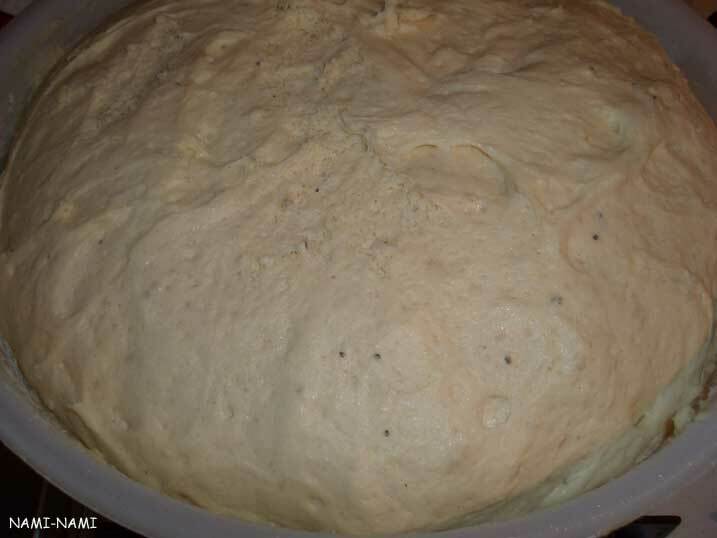 The dough is rather wet at this point, so no need to use your hands. Cover the dough with a clean kitchen towel* and put in a warm place to prove. Make sure there is no draught in the kitchen! 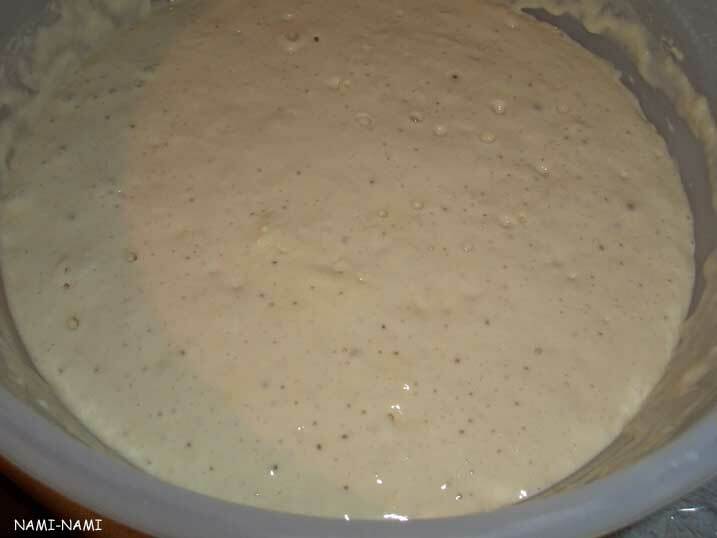 Let the dough double in size (about 30-45 minutes, depending on the kitchen conditions). It will look like the picture on the right, with small air bubbles on the surface. When doubled in size, add the salt, cardamom, melted butter and whisked eggs. Stir in most of the flour and start kneading. You will have to knead the dough for about 10-15 minutes, until it's shiny and elastic and doesn't stick to the bowl anymore. Now cover again with the kitchen towel and leave to double in size in a warm place. This should take about 45-60 minutes. Knock the dough back and leave to rise again. 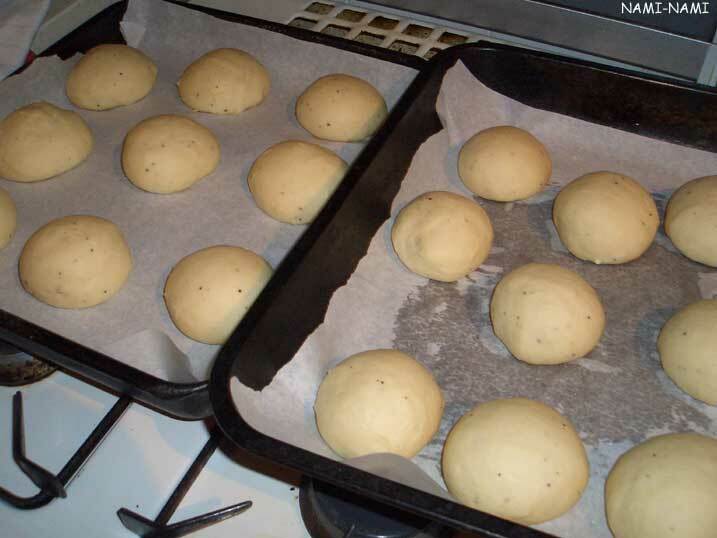 By this time the dough will look nice and all puffed up, quite dry in consistency. Transfer to a baking sheet. Let rise again for about 30 minutes. Brush with milk or whisked egg (both are fine, the latter results in a shinier bun) and bake at 200-225˚C (400 F) oven for about 15-20 minutes, until you have beautifully golden brown lenten buns. Take out of the oven and cover with a kitchen towel to soften the tops. This is essential, as otherwise you'll make a mess when you start eating the cream-filled buns! Make the filling. Whisk the cream with some sugar. 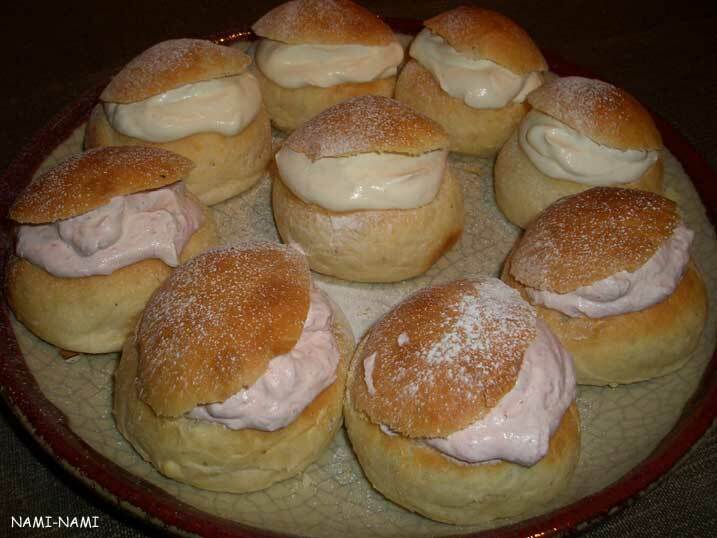 I like to include some lingonberry jam in my cream filling, as this adds a nice tart touch to the otherwise very sweet bun. Cut a small slice off the bun and fill with some cream. Put the "lid" back on. Serve. Especially delicious after a night out on a snowy hill. * It's a good idea to cover the bowl loosely with a cling film first, so if the dough rises very high, you won't end up with a sticky kitchen towel. The year that "Ed Wood" came out on video, I received three copies for Christmas. Where should this fact be filed? 1955: Legion Hut, Carlsbad, New Mexico. Elvis had played the Sports Arena in Carlsbad the afternoon before this and put on a show in Hobbs, New Mexico, the evening of that same day. 1956: Monticello Auditorium, Norfolk, Virginia. Shows at 2, 5, and 8 p.m.
1971: Showroom, International Hotel, Las Vegas. Elvis performs all his shows in spite of having a cold and fever. 1977: Sportatorium, Hollywood, Florida. Elvis is accompanied by fiance Ginger Alden. Saints celebrating feast days today include Saint Julian the Hospitaler (hospitaler means hotelkeeper)(patron saint of boatmen, hotelkeepers, and travelers), Saint Marina, Saint Melethus, Saint Ethelwald, Saint Antony Kauleas, and Saint Ludan. Birthdays: Joe Don Baker (1936, Groesbeck, TX), Judy Blume (1938, Elizabeth, NJ), Joe Garagiola (1926, St. Louis, MO), Christina Ricci (1980, Santa Monica, CA), Bill Russell (1934, Monroe, LA), Franco Zeffirelli (1923, Florence, Italy). Both Abraham Lincoln (Hardin County, Kentucky) and Charles Darwin (Shrewsbury, England) were born on February 12, 1809--that was some day in history.